1. Cut the nira into 2-cm lengths. 2. Add the grated garlic, soy sauce, sake, kochujan, sugar, beef, and nira to a mixing bowl, and mix well. Place a frying pan on medium heat, add the sesame oil and then the contents of the mixing bowl. Once the meat is fully cooked, mix in the sesame seeds and turn off the heat. 3. Skin and julienne the carrot. Boil the julienned carrots for about 5 minutes, then drain off the water and season with salt and sesame oil. 4. Place a sheet of nori on a slightly larger piece of plastic wrap. Put 60g of cooked rice (1/8 of the total) on the center of the nori. 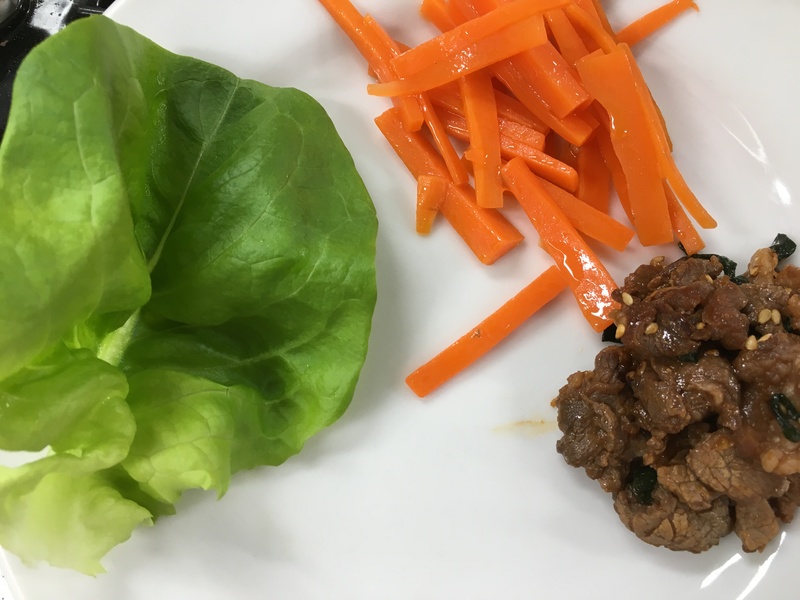 Now add a leaf of lettuce, a bit of the cooked beef, and some carrots. Add another 60 g of cooked rice. 5. 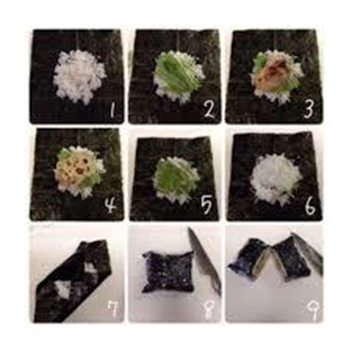 Bring the corners of the nori in to the center of the square and enclose the whole bundle with the plastic wrap. Gently press down on the bundle to flatten it a bit. Let this sit for a while to let the nori absorb moisture. 6. Use a dampened knife to cut the bundle (still wrapped) in half. 1. Squeeze out as much of the oil as you can from the tuna. Then transfer the tuna to a mixing bowl and add the mayonnaise and soy sauce. Mix well and set aside. 2. Trim off the ends of the string beans. Boil the string beans in salted water for about 1 minute. (The salt is not included in the recipe above and just a pinch will do.) Rinse the string beans in cold water and then cut them in half. 3. Beat the eggs, adding a pinch of salt. Place a frying pan on low heat, pour in the eggs and stir them as they cook. When the eggs are about half done, turn off the heat and let the eggs sit in the pan. This will allow the eggs to finish cooking with a very moist texture. 4. Place a sheet of nori on a slightly larger piece of plastic wrap. Put 60 g of cooked rice (1/8 of the total) on the center of the nori and spread it out into a square about 10 cm on each side. 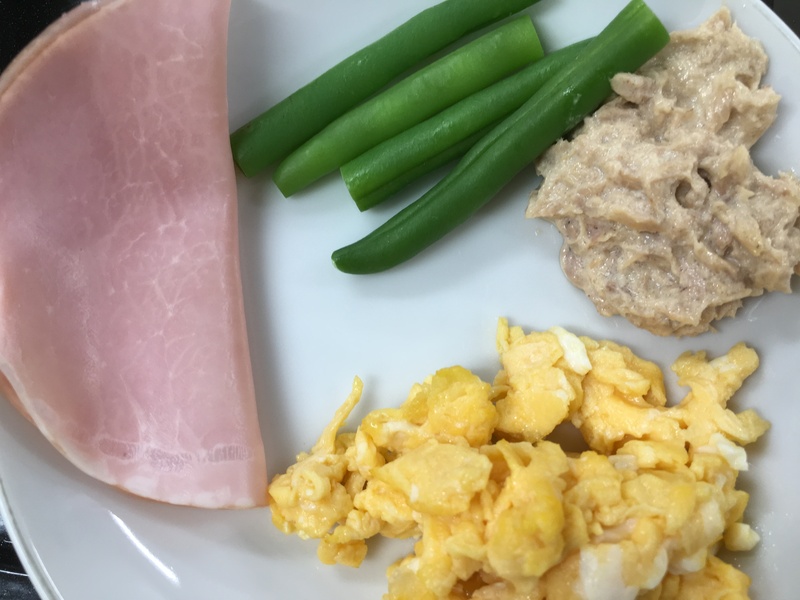 Now add some of the cooked egg, tuna, a slice of ham, and four pieces of string bean. Add another 60 g of cooked rice.